Nancy Mervar’s second children’s book about goats will be available May in area bookstores as well as through her website. 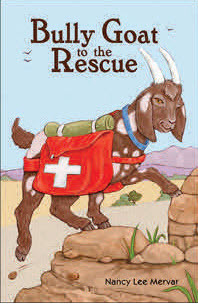 Bully Goat to the Rescue is a chapter book for children ages 8‐12 and helps them understand and overcome bullying, learn about 4‐H of America, and practice safe hiking and rescue techniques. To launch the sale of her new book, as well as its hardcover picture book predecessor, Nana’s Silly Goats, Dr. Mervar is scheduled for book talks and signings throughout the month of May. Nancy also just completed presentations at Berthoud Public Library and as part of the Author’s Festival of the Colorado Chapter of the International Reading Association’s annual conference. To find out more about Nancy’s book signings, click here.